A landing page is an essential tool that lets you drive sales and direct your audience in a particular manner. A landing page is a place on your website that you create to guide your audience to take a single, particular action. Landing pages played a significant role in the content strategy of your business and integrated into the content mapping you use for your business. Each landing page should have a defined and focused behavioral statement. A landing page should steer your audience to make a particular action. Landing pages should focus on one of your user personas since each landing page should be unique for a custom audience. Here are some basic ideas to create a landing page for your business. Focus on a single direction you want your audience to take on the page. A landing page is not the place to push everything about your business. Focus on a unique product or service, and drive your audience to take action by using an active Call To Action that gets results. Always show the benefits of your product or service. 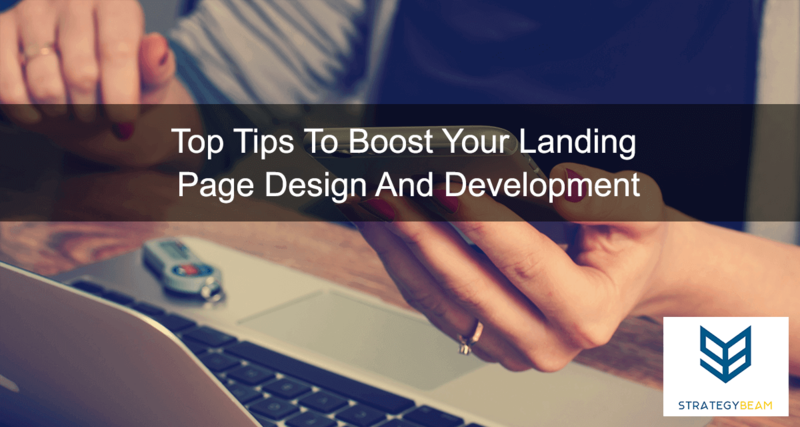 Each landing page is a valuable opportunity to talk to your audience. Still, showcase benefits and remind your audience of how it will solve a problem they are dealing with. Use strong action verbs that have a direct relationship with your offering. Use words like “Subscribe,” “Download,” or “Purchase” to help drive efforts. You should use a particular word or phrase that is relevant to your product or service. Your landing page should reflect the unique brand of your business by using consistent tone, color, and logos that are in use throughout the rest of the website. Due to the focused nature of a landing page, there are some crucial design elements to keep in mind. Your audience is quickly browsing on your website. You don’t want your message to get lost in a pile of text. Consider breaking up long blocks of text, and I suggest not using any more than two sentences. Use strong Call To Actions and remember your landing page should convert, not entertain or inform. I suggest using a Call To Action every 100 – 125 words to encourage your audience. Your audience reads your copy from left to right. You want to keep images on the right side of the screen. This will prevent your image from dominating the screen and burying your messaging. Buttons can help drive conversions, and that is the primary focus of a landing page. Test colors and wording, along with placement on the page. I recommend putting buttons on their row (no text to the left or right). Also, use a color palette that is not the same as your primary color palette, so it sticks out more. Only use images on landing pages if you need them. On mobile and smaller screens, images move into a single-column for responsive design. This can push your text to undesired locations so check your content! Use video if you can, because the video is an excellent way to create a personal appeal to your content. You can also show a lot more content in an emotional manner through a short video than you can use just text. Integrate testimonials when possible. Testimonials are an excellent way to promote claims on landing pages. I recommend always using testimonials on a landing page. I recommend placing testimonials near Call To Actions and your main buttons. This will draw the eye of your reader toward that area, and encourage action with the validation testimonials provide. While a video is great, you will likely still need some copy of the landing pages. Great copy will help you with Search Engines and deliver your message if your video isn’t watched. Here are some ideas to create the great copy on your landing pages. Always place your strongest points at the top. People will be scanning your page from top to bottom, left to right. By putting your highest points at the top, you ensure your audience will read them. The purpose of each landing page is to have your audience take action. To encourage this, be sure to always use action-orientated words. Use bullet points when possible. Your audience is likely scanning your content, so don’t bury your message. Use short bullet points to get needed information to your reader without weighing them down. Use underlined text sparingly. Your audience is used to clicking on highlighted text because it looks like a link. You don’t want your audience to click on the regular copy because they may think you are tricking them and this will reduce trust and credibility. Try not to use bolded text too often. Only bold your text on things that are important, like trigger words or essential phrases. You can use italicized text more often than underlined or bold text because it is not as disruptive. You only want to use italicize when necessary, and when it makes sense. Use with caution… but use to make a point. Now it’s your turn. What tips do you have to create great landing pages for your business? Let me know in the comments below!